All commissioners and the Mayor were present for the Oct. 20th City Commission / Municipal Authority meetings. 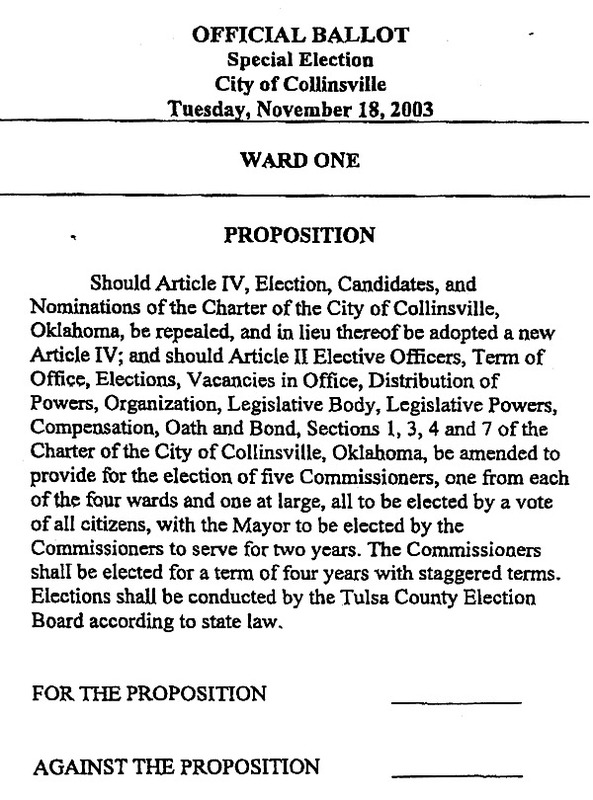 The Collinsville Municipal Authority approved the consent agenda expenditures. They also renewed the city insurance policies with Bomford, Couch & Wilson ($28,024 premiums for Property + $63,982 for General Liability, Public Entity Management Liability, Employment Practices Liability and Commercial Auto coverage). The Trustees transferred $30,000 from the CMA Fund to the City General Fund. The Trustees voted to deny a request from the Chamber of Commerce "to waive excess sewer, fuel adjustment and refuse" from their monthly bill, as their building (at 11th & Main) has not been occupied since they started paying utilities there in May. The Trustees stated they did not want to set a precedent which might start other building owners or occupants making similar requests. The CMA denied a $160 Tort Claim by John Fine for a TV he claimed was damaged during the City's October 3rd power interruption. The Collinsville City Commission approved it's consent agenda expenditures. The commission gave the City Manager the approval to dispose of the front and back porches from the former portables buildings used by the Police Department (before their move to the old Post Office location at 11th & Center). It was suggested he check to see if the porches might be usable by the Fire Department at their portable building. The City Commission approved a two year extension to the new Meadowcreek Methodist Church (east of town) to have their parking lot paved. Commissioner Gail Rogers suggested a one year extension only and voted against the two year motion that was approved. Rev. Larry Wilson indicated it was the church's desire to have it done in less than a year also, but was requesting the same extension offered recently to other new churches. The annexation of 364 acres (in the SE corner near Highways 75 and 20) requested by Cooper Mesa, LLC was approved. Adding this property to the Collinsville City limits was treated as an emergency allowing Ordinance 739 to be acted on at this same meeting. The development (labled "Coopers Crossing" on a draft plat) will be a housing addition with a commercial strip facing Highway 20. The commissioners seemed eager to approve the annexation but there was considerable discussion about whether the city could economically provide electric, water and/or sewer to a property at the outer edge of the city's boundary in the 3 to 5 year time frame planned by the developers. V.V.E.C., PSO and Rural Water Dist. 3 would likely also be contending to serve this property, but the developers indicated they were open at this point to utilities from any vendor. They also indicated a possibility of combining efforts with a development north of Highway 20 (introduced at the July 21, 2003 Commission meeting by Kyle Smalygo) on utilities run from the core city along Highway 20 or other section lines out to these properties. An agenda item calling for "consideration and possible action on immediate demolition of entire City Hall Complex and begin preparation for construction of a new and enlarged 2-story structure ..." was put in the form of a motion by Commissioner Pam Porter, but died for lack of a second. This followed a very lengthy discussion dominated by several citizens requesting the burnt out building be torn down rather than attempt any reconstruction. The Commission had approved a resolution April 7, 2003 calling for salvaging the building. Commissioner Porter stated she had tried unsuccessfully to have town meetings on this subject in previous months. No commission action was taken at this meeting. Several options ranging from town meetings, to an election, and petitions were discussed/requested in an (unusually unrestricted) exchange from the floor, commission and city attorney. City Manager Mike Tinker indicated that in meeting with County Commissioners recently that Collinsville was expected to use their insurance money for the building cleanup and Vision 2025 funds for construction. Cooper Mesa developers answer Commissioner questions.